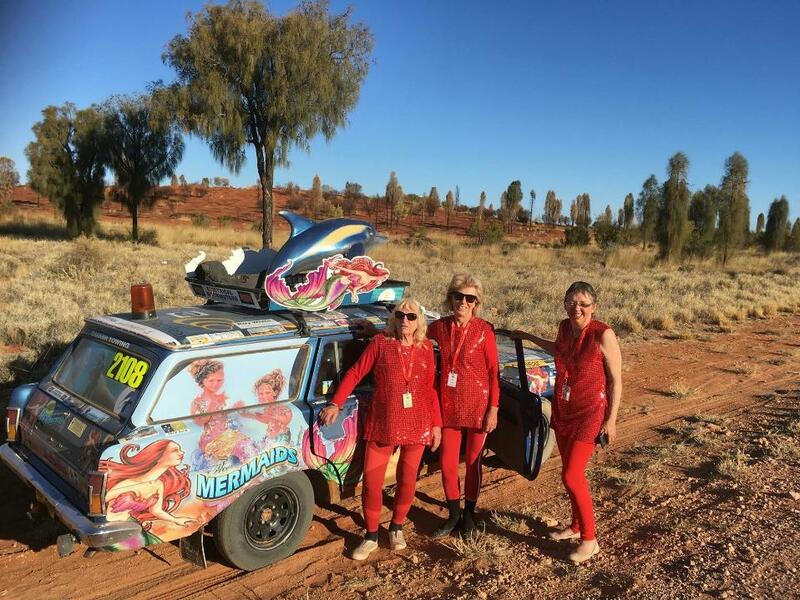 Day 7: Red Day in the Red Centre! Although dubbed the ‘most breakdowns’ the Mermaids only had 3 lots of car problems and these were fixed as they had lots of support from the Variety crew. The rest, shredded tyres, lights falling off, the horn falling off, mudguards falling off, were due to the state of the roads, which were real bush roads. “It’s much much worse than people think it is, or are seeing on the news. We saw no cows through the whole of our trip and only a handful of sheep.” Beryl said yesterday. Was there any rain while you were out there? What were the highlights this year Beryl? He fixed the car and has kept me going through subsequent years of Bash trips. Any other highlights – things seen along the ways? “The painted silos were brilliant of course, but Uluru and seeing The Olgas would have to be up there. Friday, as we stayed to look around, we visited the Stanley Chasm – just magnificent. 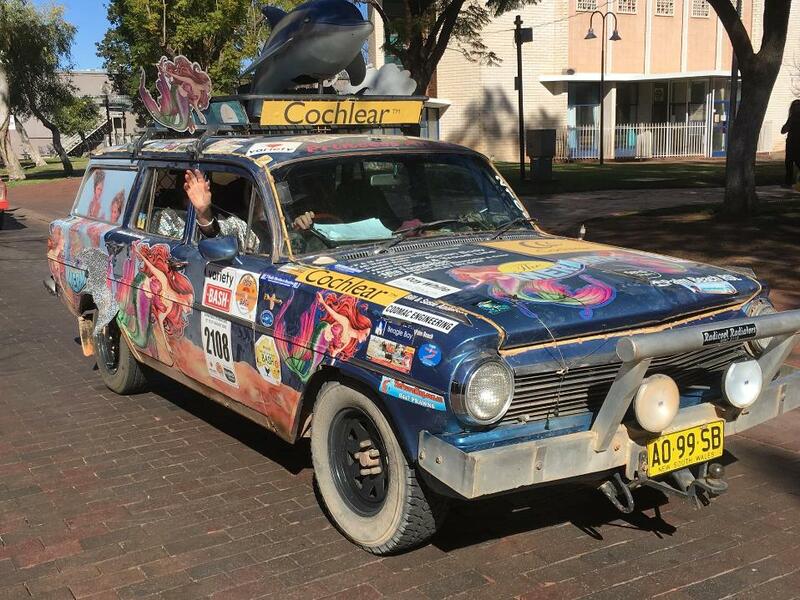 Elyse Cole has said this will be her last Bash on the road, although she will continue you to help fundraise for 2019, your 21st Bash, which supporters are hoping to make the Biggest Year Ever for Car 2108 and the Palm Beach Mermaids. How do you feel about Elyse not coming on the road next year? “I can’t imagine doing a Bash without Elyse. She has been the backbone for so long I’m not sure what I’ll do without her, she’s just amazing all that she does each year. When are the Mermaids coming home? The 2018 BtoB Variety, the Children’s Charity Bash has raised 1.7 million to put towards Australian youngsters. Variety – the Children’s Charity supports kids and families who are facing many challenges through sickness, disadvantage or living with Special Needs. Congratulations Beryl and others of this group! Keep on bashing!! Mermaids through the start arch and all systems are go! 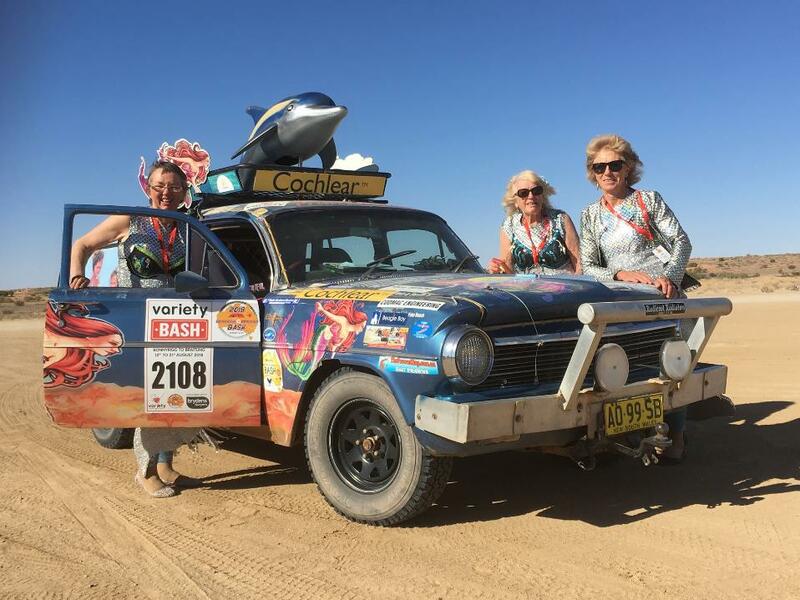 Mermaids had an eventful start with an axle replacement at Wentworth Falls but went on to get onto the dirt on the road to Bathurst and to finish in West Wyalong tonight. Day 1 done! Day 2. Back To School Theme. Breakfast start at West Wyalong Public School. On the road, from West Wyalong via the Weethalle grain silos, Ivanhoe for lunch then some great dusty bumpy roads from Menindee to Broken Hill. Day 3 Start From Broken Hill North Public School. Great breakfast and send off by lots of very excited kids. Day 3. Broken Hill To Tibooburra. Mermaids breakdown party with lots of Holdens in the desert. Finally made it White Cliffs for a late lunch. Evening drive with lots of gates to arrive in Tibooburra late but all well including car! Leigh Creek breakfast at school. Jan Love the principal - a Teacher of Deaf! Triples fun stop at Farina. The Lake Eyre Yacht Club at Maree. Lunch at William Creek. 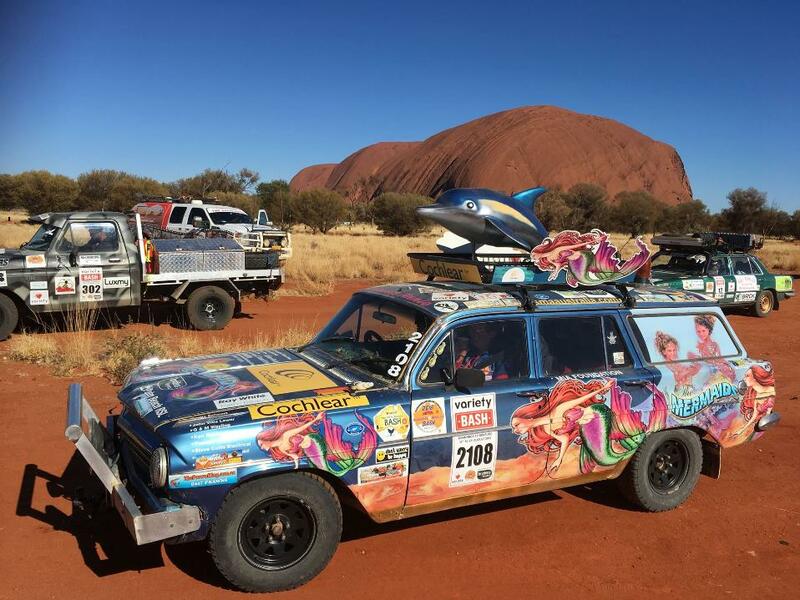 A few more Mermaid repair stops on the way to Coober Pedy. Engine bolt loose. Shredded tyre etc. Happy to see our underground room at the end of the day! Day 6. Coober Pedy - Oodnadatta - Marla. Great morning tea stop at Painted Desert. More breakdowns, brakes gone, second tyre gone, front wheel steering arm gone again.Finished the day at the back of tilt tray with Ron and Cooter. Thanks to many helpers along the way. That’s the Bash spirit that we love!! Day 7. Saturday From Marla To Yulara. Red Day in the red centre. Late start due to repairs and new tyre etc. Mermaids had an extra passenger, thanks Brendan from The Pigs. Arrived at Yulara just in time to catch sunset over Uluru. Wonderful! Day 8 Breakfast At Yulara School. Thank you to the principal, kids and community of Yulara. Variety donation to the school was a robotics and coding program as part of the literacy and numeracy curriculum. Day 9. Sunday Evening Yulara. Sunset drinks with a view of Uluru, followed by a wonderful ‘rockstar’ dinner under the stars. Another wonderful Bash experience. Huge breakfast at Braitling Primary School with many colourful characters and Mr and Mrs T-Rex. Final parade into Alice through Todd st Mall and the final Variety arch for 2018! Final night dinner at Hilton where Mermaids got award for raising over $33,000, and also got the award for most mechanical breakdowns!! All done and dusted for 2018.